I saw the new Fawnatics challenge and I could finally piece the card together I had in mind for weeks. The set I used is the "Blue Skies" from Lawn Fawn. It has some lovely hot air balloons in it. I used it for the "make your mark" challenge from Addicted to Stamps as well as the Weather challenge from Heart 2 Hearts. The background is some distress inked "faded jeans" mixed with a bit of white and blue acrilic paint spatters. The sentiment is stamped on black paper and die cut like the cloudy background with some stitched lines. 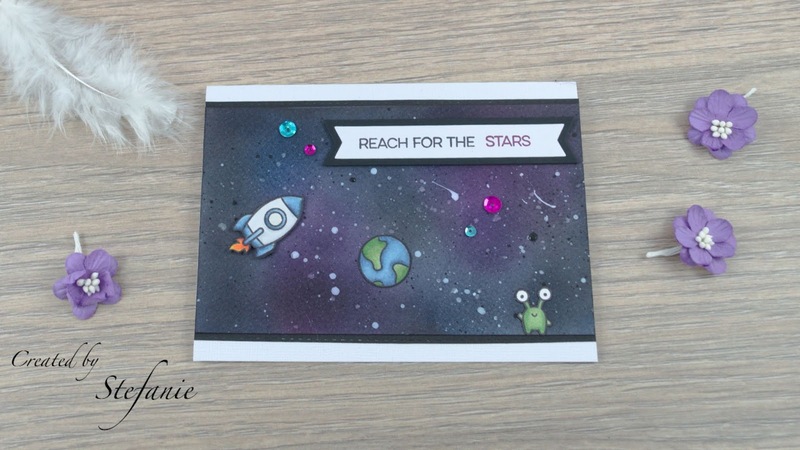 The hot air balloon is coloured with the Copic markers (R32, R22, R20 and E 31, E34, E35). The heart got some sparkles with a wink of stella. 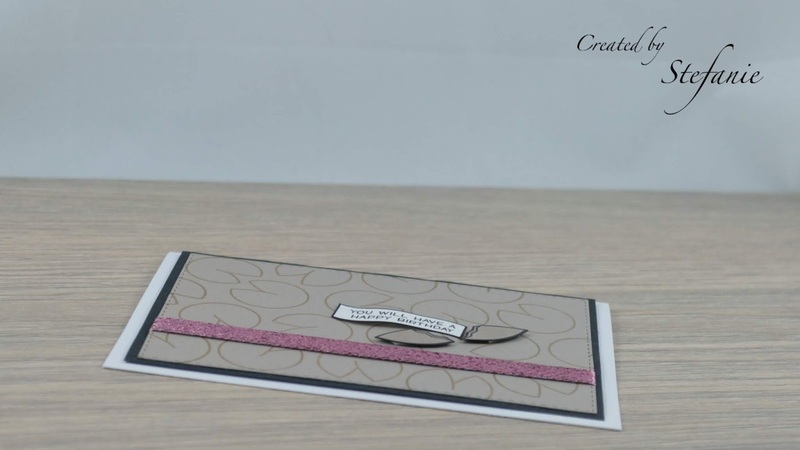 I also entering an Anything goes challenge from Creative Fingers and Simply Create Too. So for my first card in 2019 I used the "Manatee-rific" stamp set from Lawn Fawn with some inspiration of the fantastic Kajcyika Crafts. I'm a bit unsatisfied with the white spaces between the triangles, but I still like the outcome. 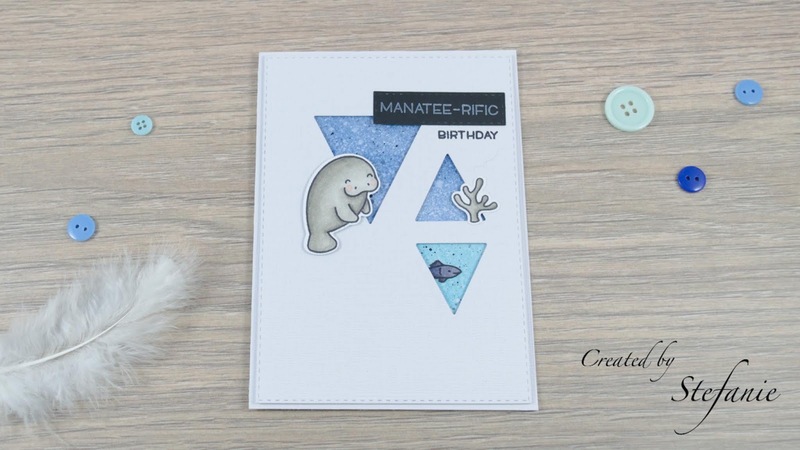 I really like the cute face of the Manatee and it is an animal for the Sparkles Monthly Challenges and the Crafty Animals Challenge. 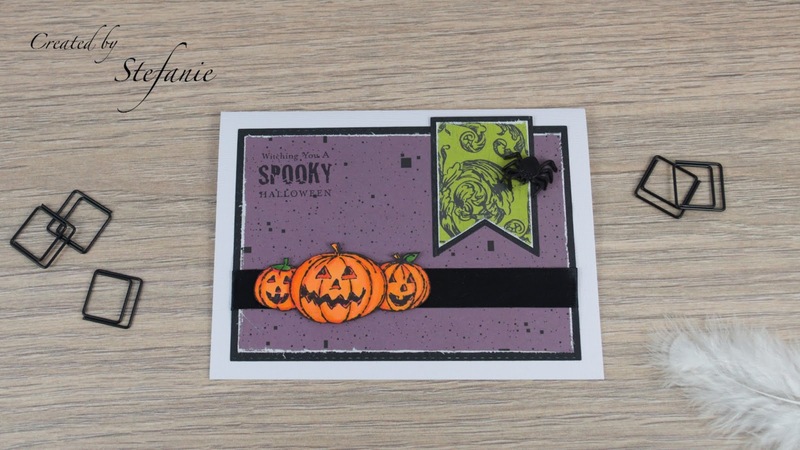 The smaller images are from the "Fintastic Friends" stamp set from Lawn Fawn. 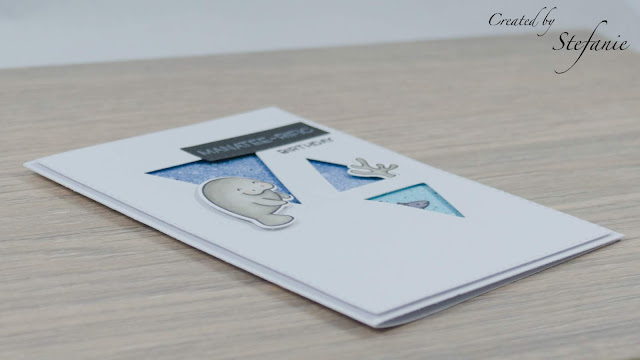 The Manatee is coloured with my warm greys from Copic and a pink blush for some extra dimension. I used some blue distress inks as background and added some water and paint splashes to add some extra colours. The layers get some extra dimension to the card as it is pretty white and CAS for the rest. 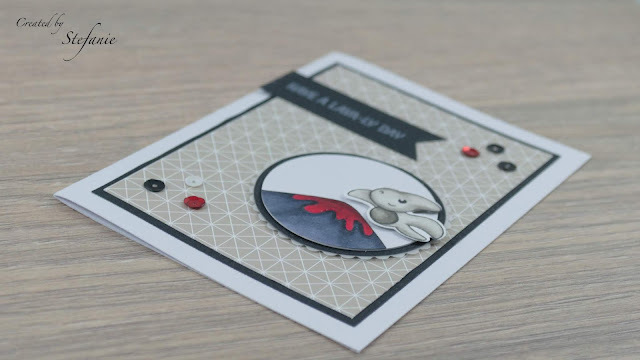 As I need a lot of not girly cards, this one is another cute but still manly enough for all the lads out there card and perfect for the My Time to Craft Challenge with theme men only. Ok, I was very busy in the last few month. There were some changes which needed some attention. 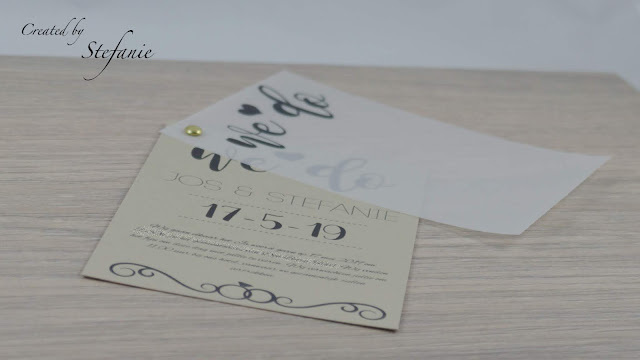 So, I am getting married in a few month and I had so much planning to do, even for a small wedding. Of course I made the invites etc myself and I was still busy with my new years resolution to get healthier and more active. As I am not a really bling girl and my boyfriend hates bling, I made some pretty standard invites, but I love them. We decided to do our wedding just like we want to and moved away from all the obligatory things and just get married, at the beach and eat and drink like we want to. But this was the reason I did not craft as much as normal. But most things are planned now and I can get back into my routine again. My little niece will celebrate her 7th birthday very soon and I had to get some inspiration for an unicorn loving little one. So The decision for the cute "Fairy Tale Unicorns" set from Clearly Besotted was the easy part, the rest of the design a bit more tricky. She loves pink, but only pink clothes, no pink things except stuffed animals. 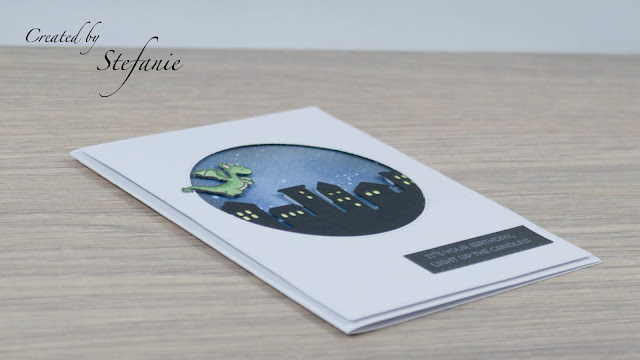 So, no traditional girly card needed. I got some inspiration from Pinterest. 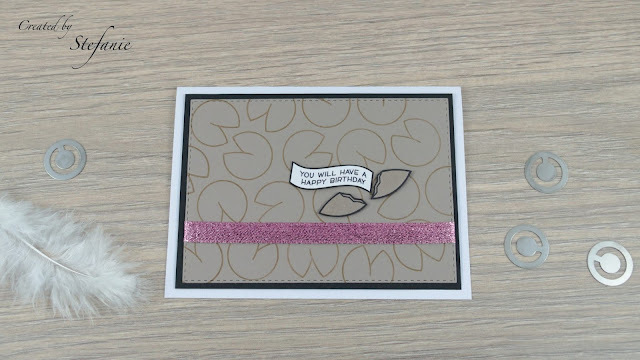 I used the "Dragon Wishes" from Mama Elephant as sentiment, because it fits so well. 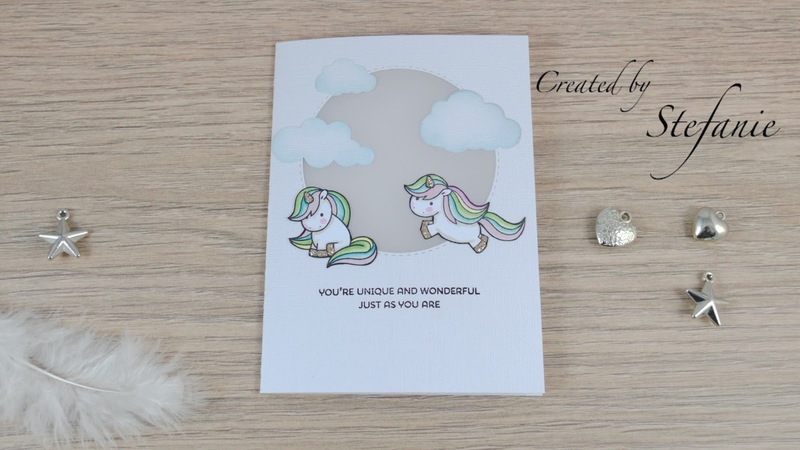 The little unicorns got some pastel colours with my Copic Markers and of course some sparkle with the platinum coloured Stickles, which I used with a thick layer to get solid glitter on the critter and fitting for the Crafty Animals challenge. 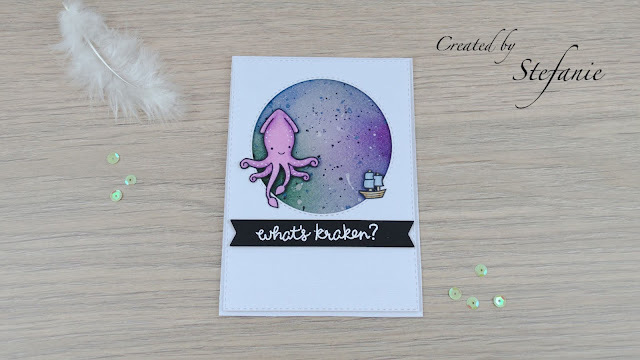 The clouds are from MFT with some no name dies I have like for ages (and no brand names, they had one before I lost the packages) and got a bit "tumbled glass" Distress Ink on them. The background and the playing unicorns fit the AAA cards challenge "on the move" quite well. 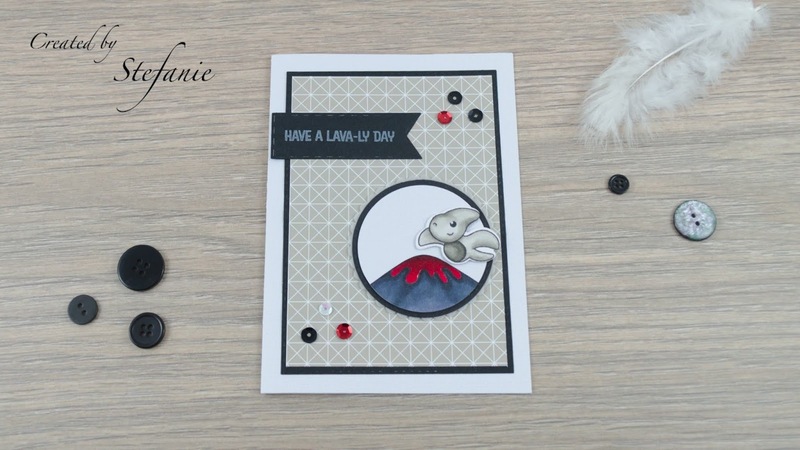 I cut out one if my Crealies stitched circle dies and used a piece of vellum for a softer look (the circle was a bit big so I needed some filling for the card design). 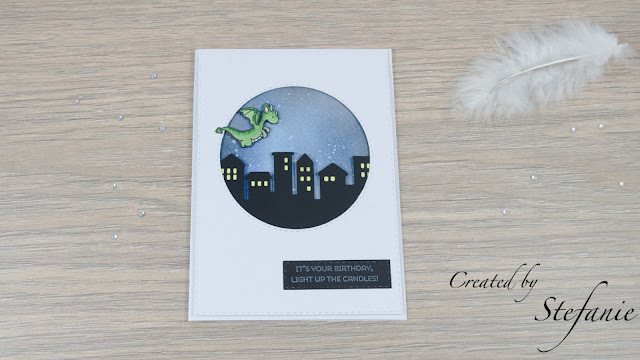 At first I wanted to add the little falling star on my card as well, but thought it could be a little crowded and choose against it. It is not a traditional birthday card and a friendship card would be another really good theme for this one. Perfect for the Papercraft challenge. After a really hot summer, I really want a fall and winter weather. It is so much easier to stay inside and craft without the sun shining in your eyes. Even my dog has had enough. He is part Husky and the warm temperatures are not his favourite ones. So I needed some kind of a wedding card for a couple with a fable for blue. Kind of? Yeah, it is not a real wedding, but a registered partnership, but it is still a big deal. That part combined with my desperate wish for colder weather, the idea of a cute snow landscape "wedding" card was born. So I made a nightfall background and left out a little circle as the moon. It is a Distressed inked one with a lot of paint spattered in blue, white and black. So I made my own background for the Do AllKreatives Challenge. 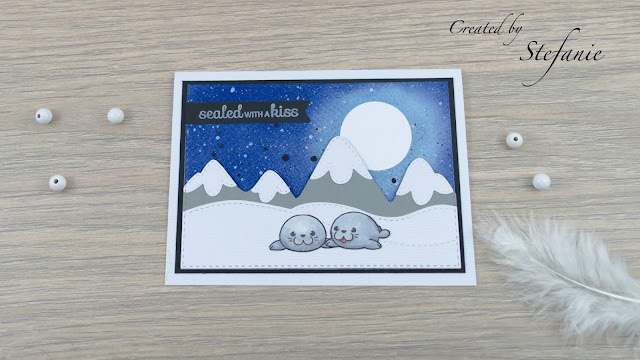 The cute seals are from the Clearly Besotted stamp set "Seal of Approval" and I love the fitting sentiment as well. The seals fit the 2 Crafty Critter Challenge too. I created a snow landscape from several dies and mounted the mountains on foam. The Stamps & Fun Challenge from wants to see some die cuts and I guess I used quite some (except the moon and black base layer, everything is done with a die cut).